Solar Heating System have greatly evolved in the last 20 years both in performance and price decrease as the world demand for solar heating systems continues to grow. Specialized selective coatings are able to capture up to 96 % of the suns solar thermal energy. Evacuated tubes that can reach temperatures of 450 F are controlled with state of the are Solar differential controls. Specialized solar storage tanks have internal heat exchangers coupled with extra insulation and internal temperature ports, stainless steel insulated piping removes the need for cooper and soldering and allow you to install a system in ½ the time! At Northern Lights our Solar Heating Systems work seamlessly by integrating with the best components on the market to provide you with highest returns on your investment. We call this “Plug n Save” technology where by a home owner or a business owner can quickly assemble any of our solar heating systems without any formal training and be guaranteed to have both maximum performance with unparalleled reliability and safety. All our system are expandable to 2nd heating zones to form larger solar heating systems. Our solar water heaters can be combined with space heating or pool heaters to maximize your investment. All our system come with Smart Phone integration so you can see your savings in real time. 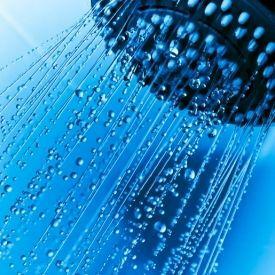 Solar hot water heater have been around commercially since the late 1800’s. Today solar water heating have drastically evolved due to the high performance available through solar vacuum tubes. 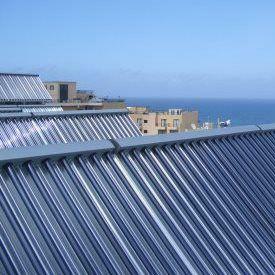 There are an estimated 200,000,000 solar water heating systems worldwide with Asian leading the way and Europe in 2nd. Our solar water heating system use an active loop technology that indirectly heats the hot water through a closed loop and an internal heat exchanger located in the bottom of a specially designed solar water tank. Sophisticated solar differential controllers are able to maximize the systems performance delivering on average over 2 MW of FREE heat energy to your domestic water system. Our system can be used as either a single tank solar water heater (Supplemental), or a two tank (Pre-Heat) solar water heater. This is possible because all our solar storage tanks contain a 4.5 Kw back up heating element that can be used should the customer decide. All our solar water heating system are able to expand to a second heating loop. Thanks to advanced solar vacuum tubes, Solar Home Heating or Solar Space Heating is an economical way of harnessing the Sun’s Energy and transferring to your home heating system. Our Solar Home Heating Systems use a large 119 gallon state of the art solar hot water tank that has two internal heat exchangers. The bottom heat exchanger attaches to the solar loop to supply solar heat energy to the tank. The top loop removes heat as needed from the solar storage tank to be used by the home’s heating system. Our solar Home Heating System come complete with both the solar loop and the heating loop. 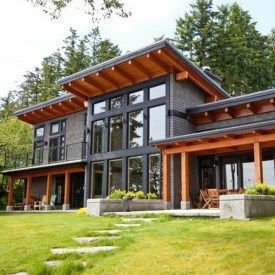 We can integrate into a forced air furnace, in floor heating loops, radiators and even geothermal loops can take advantage of the solar energy. Advanced dual zone RESol BS plus controllers manage the system along with a FlowSol solar pump station. All our solar heating systems are designed to provide both FREE domestic hot water as well as providing you 50-60% saving on your heating bill. Solar Pool Heating has been around for nearly 50 years with low cost black plastic mats and black hose piping being the common materials for heating pools. The problem with this type of system is that they are very inefficient and consume up to 50% of the pools pump power to push the water to the roof top. These systems are susceptible to constants roof leaks and stains and only work if the air temperature is warmer than the pool. Any slight amount of wind quickly removes any heat created as they act as large roof top radiator. Our solar pool heaters use a state of the art closed loop system that operates a small pump consuming less than 50 watts of pumping energy. The heart of our system are solar vacuum tubes that can provide heat to the pool in any outside temperature and have zero effect at any wind speed. 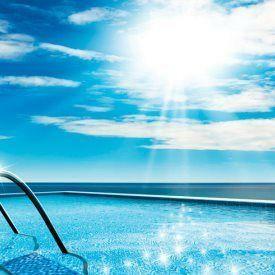 In fact our solar pool heaters can heat a pool at or below freezing conditions in full cloud cover! The closed loop system transfers the solar heat energy indirectly through a stainless steel or titanium solar pool heat exchanger. This ensure that chlorine does not have any effect on the solar equipment and can provide up to 20 years of maintenance free operation. State of the art digital differential controllers maximize the systems performance and also allow for WiFi connection to monitor and record the systems performance in real time. Our package systems can integrate with any pool both indoors and outdoors and can be used year round without freezing. Similar to solar pool heating system, hot tub heating is the same but operates at a higher temperature. Because of solar vacuum tubes this it is possible to heat your hot tub year round including the winter with solar. The solar hot tub heater is a closed loop that integrates directly into your hot tub heating system via a high flow stainless steel or titanium heat exchanger. During the day the solar energy generated is transferred to the hot tub via this heat exchanger. In the evenings your existing heat source may be needed in to keep up in colder winter season. Solar Hot Tub heating system have shown to save owners upto 80% on their hot tub heating bills! All our solar heating package come ready for a second zone that can be used to heat a domestic hot water, pool, or space heating applications. When integrating with domestic hot water and a solar hot tub, you have the advantage of storing the heat energy in the solar storage tank. This allows the customer to buffer the heat energy when the hot tub does not need it and draw upon it when needed. The advantage of this type of integrated system is you get both Free Hot Water and Free Hot Tub Heating! Commercial, industrial and process heating with solar vacuum tubes is one of the most cost effective means of using solar energy. Larger scale systems means that higher yields are possible with greater ROI’s. Vacuum tubes can produce much higher heat levels than other types of collectors and business such as hotels, restaurants, car washes, agricultural and food and beverage industry are prime candidates for taking advantage of the opportunities of commercial solar heating. Grant and low interest financing are available in most states in the USA for commercial solar heating projects. FREE Project engineering is available with all our commercial heating packages.